« Join Brighter Tomorrows for our Psychic Night Fundraiser! 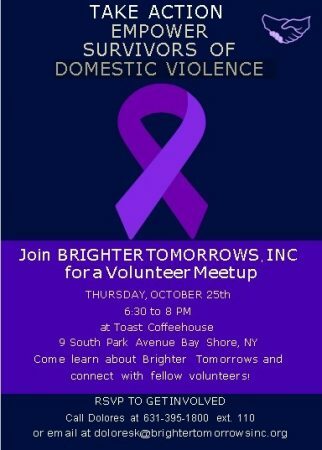 If you are interested in making a difference in the lives of DV survivors please join us on Thursday, October 25th at 6:30pm, Toast Coffeehouse, Bay Shore. There are many ways to get involved. Even small actions can have a big impact! We hope to see you on the 25th. If interested, please RSVP to Dolores, 631-395-1800 x110. This entry was posted in Events, Latest News. Bookmark the permalink. Follow any comments here with the RSS feed for this post. Both comments and trackbacks are currently closed.